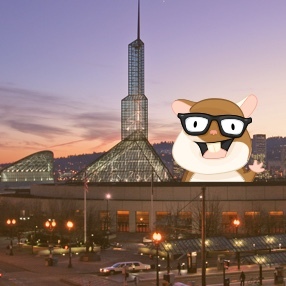 Location & Hotels | EmberConf 2016 - March 29 & 30, Portland, OR. Meet us at the Oregon Convention Center. The Convention Center is 20 minutes from the Portland International Airport and just blocks from our partnering hotels. EmberConf will take place upstairs in the Portland Ballroom and Lobby. Stay at our official hotel for a discounted rate. Rooms sell out quickly, so reserve soon to be sure you're staying with the rest of us. Update: Our room block is sold out. There may still be room at the DoubleTree, but barring cancellations, it'll be at a different rate. We've negotiated discounts for those flying between March 23 and April 5. Getting to the Convention Center. Take Rose Quarter/Broadway-Weidler St Exit (302A), go right on Weidler, and right on Martin Luther King Jr. Blvd. Take the Lloyd Blvd exit (1) and stay on Lloyd Blvd all the way to the Convention Center. Take I-205 South to I-84 West. Exit at Lloyd Blvd (1) and stay on Lloyd Blvd all the way to the Convention Center. Bike Parking at the OCC is abundant. See the map of bike parking locations for more details. Uber has come to Portland! Use this link or promo code ​uberEmberConf​ to save up to $20 off your first ride. Good for airport trips and all over Portland.